Great Basin National Park, located in east-central Nevada near the Utah border, takes its name from the dry and mountainous region between the Sierra Nevada and the Wasatch Mountains. The park is known for its groves of ancient bristlecone pines, and for the Lehman Caves at the base of Wheeler Peak. It was originally created by a presidential proclamation from President Warren G. Harding in 1922 as Lehman Caves National Monument, and was incorporated into the national park in 1986. 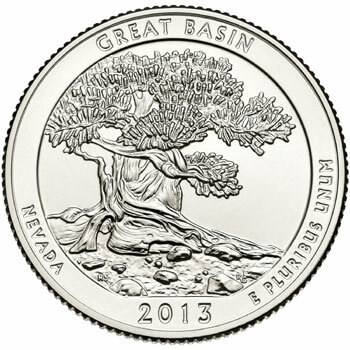 The Great Basin National Park Quarter depicts a single Bristlecone Pine tree in the rocky moraines where the trees grow. Also included in the design are the incused phrases “Great Basin”, “Nevada”, and “E Pluribus Unum”, as well as the date of issue. The coin will represent the third issue of the United States Mint’s America the Beautiful Quarters Program for 2013. A circulation release date of June 10, 2013 has been indicated by Federal Reserve Bank Services. An official launch ceremony for the coin will be held on Thursday, June 20, 2013 at 10:00 AM PT. The location of the ceremony will be the Great Basin National Park Visitor Center, 100 Great Basin National Park, Baker, Nevada 89311. On the evening before a coin forum will be held from 7:00 to 8:00 PM PT at the same location. The design will also be released as part of the America the Beautiful Five Ounce Silver Coins. Looking forward to this design in the 3″ size. It’s the best of the 2013 ATB designs and perfectly fits the rounded opening. Last year’s Acadia was similarly balanced and well situated within the frame. Really great design concepts are being churned put by the Mint.